Students with prior credentials are gradually making up a bigger share of the degree earner population, according to the latest National Student Clearinghouse Research Center’s Undergraduate Degree Earners Report. For 2017-18, 2,254,846 students earned their first undergraduate degree, an increase of 1.5 percent compared to 2016-17. Meanwhile, 722,547 graduates earned their second or third undergraduate credential, 4.4 percent more than last year. Thus, a total of 2.98 million students who earned an undergraduate degree (bachelor’s or associate) in 2017-18, only three-quarters represented new, first-time college graduates. 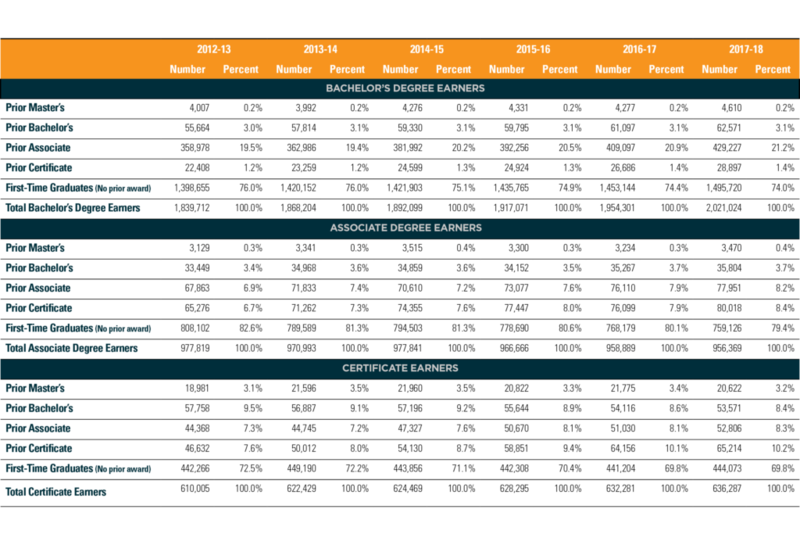 Almost half–46 percent–of the growth in bachelor’s degrees awarded between 2012-13 and 2017-18 went to those who already had a postsecondary credential, such as an associate degree or a certificate (see Table 1). Overall, more first-time college graduates were added to the population in 2017-18, but the trend varies markedly by age group, see figure 2, and credential type, see figure 3. First-time graduates under the age of 25 saw continued growth in 2017-18, an increase of 58,566 graduates or 3.6 percent growth, compared to the previous year. First-time degree recipients in the 25 and over age group (associate and bachelor’s combined) decreased by 23,909 graduates or four percent, compared to the previous year, which reflects post-recession enrollment declines among older students. Even though enrollments have been declining for years, the number of undergraduate degrees awarded continues to grow. This is partly because of rising completion rates, but also due to degree stacking as students increasingly earn more than one undergraduate degree or certificate.